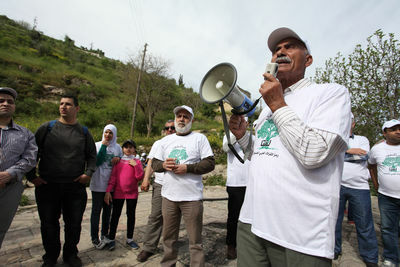 Palestinians from across the West Bank and Israel gathered in confiscated Palestinian villages, on both side of the 1967 Greenline, to commemorate Land Day. Land Day is seen as a day of resistance action in defense of Palestinian land. 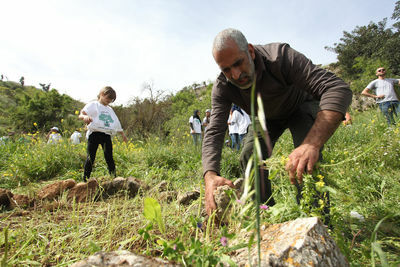 Annual Land Day events are held by Palestinian communities within the State of Israel, in the occupied territories, and in the Palestinian diaspora. 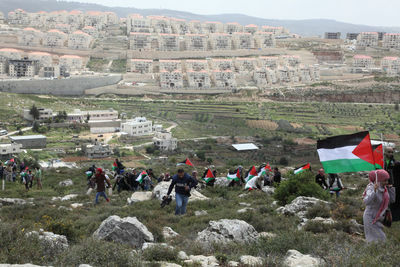 Land Day events in 2015 included a 'return march' by the community-in-exile of Lifta, many of whom today remain only a kilometer or two from their original homes. Today there remains a small but very active community-in-exile of Lifta's refugees in East Jerusalem, and it was this group, under the banner of their community grassroots organisation 'Sons of Lifta' who spent Land Day inside their home village. Although many of the village's houses remain intact and the refugees live only a ten minute journey away, they are denied their rights to return to live in the vilage by the State of Israel. Land day first started on March 30,1976, when mass demonstrations broke out among Palestinian communities in the State of Israel in protest at an Israeli state plan to confiscate 20,000 dunums (2,000 hectares) of land around the Palestinian villages of Sakhnin and Arraba in the Galilee. This was one of the first examples of mass coordinated action being carried out by Palestinian citizens of Israel. Protests were held from the Galilee in the north all the way to the Negev (known as the 'Naqab' to Palestinians) in the south. Over the course of the day 6 Palestinians were shot dead and more than 100 were injured. Ever since these events, Palestinians have commemorated March 30th as 'Land Day', or 'Yom al-Ard' in Arabic. In Another Land Day event, activists in the village of Wadi Fukin in the West Bank attempted to plant 350 olive tree saplings on land that is threatened with expropriation by the expansion of the Israeli settlement of Sur Hadassah. All Israeli settlements within the 1967 occupied Palestinian territory (oPt) are illegal under international law. Before more than a handful of trees could be planted in Wadi Fukin, Israeli soldiers rained clouds or tear gas on to the activists bringing the Land Day event to an abrupt halt. For Palestinians, Land Day is an important annual event which brings together many thousands of Palestinians across historic Palestine in the defence of Palestinian land. 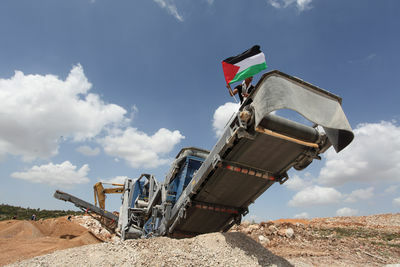 A Palestinian youth raises a Palestinian flag from the top of settlement construction machinery within the construction site that is expanding the Israeli settlement of Sur Hadassah. Sur Hadassah is located on the land of the West Bank Palestinian village of Wadi Fukin and the land of the pre-Nakba Palestinian village of Ras Abu Ammar. Wadi Fukin/Ras Abu Ammar, West Bank/Green Line, Palestine. March 30 2015. A small group of activists reach the construction site on the top of the hill in which Sur Hadassah settlement is being further expanded. 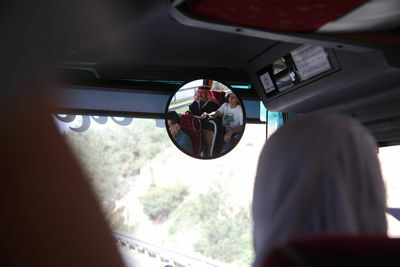 Wadi Fukin/Ras Abu Ammar, West Bank/Green Line, Palestinel. March 30 2015. 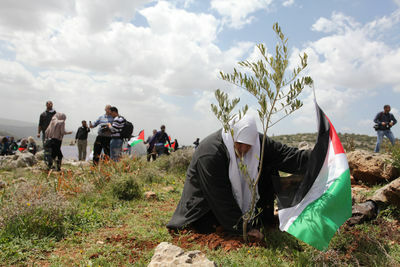 An elderly Palestinian women plants an olive tree sapling on land of the village of Wadi Fukin, which is threatened with confiscation by the expansion of the Sur Hadassah Jewish settlement. Wadi Fukin, West Bank, Palestine. March 30 2015. 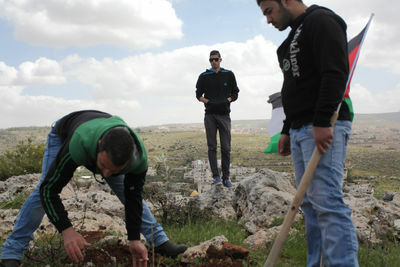 350 olive trees were brought to Wadi Fukin to be planted on the lands threatened by settlement expansion. Wadi Fukin, West Bank, Palestine, March 30 2105. 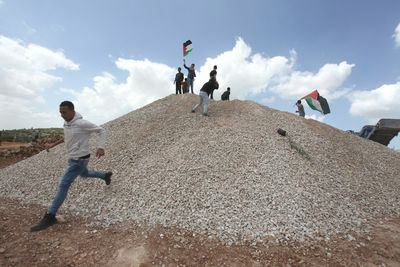 Activists make their way up a hill toward land that is threatened by the expansion of the Sur Haddasah settlement. In the background, the huge Beitar Illit settlement is also built on the land of Wadi Fukin. Wadi Fukin, West Bank, Palestine, March 30 2015. In the West Bank village of Wadi Fukin, an olive tree planting event is underway with local activists and refugees from Bethlehem's refugee camps to commemorate Land Day on March 30th 2015. The refugees ended their Land Day action with Friday prayers at the edge of Lifta's spring under the watchful eyes of Israeli security forces and Jewish orthodox youth from the nearby settlements. Palestinian refugees from Lifta. Lifta, West Jerusalem, Israel. March 27 2015. 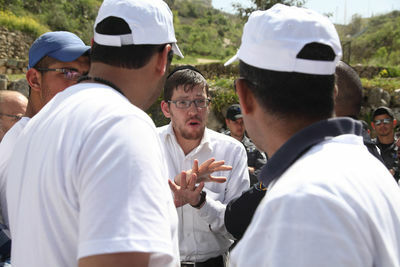 A Jewish youth from a nearby settlement talks to Palestinians commemorating land day in the village of Lifta. Palestinian refugees and Jewish orthodox youth, Lifta, West Jerusalem, March 27 2015. Lifta's mosque is also still standing today and offers sweeping views across the western slopes of the village from its arched windows. Palestinian refugees from Lifta. Lifta, West Jerusalem, Israel, March 27 2015. 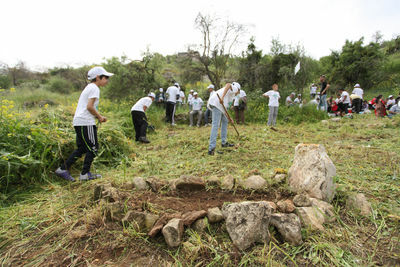 Cleaning and restoration work in the village cemetery has become a focal point for many events held by the community-in-exile when they visit Lifta. The refugees' ancestors remain buried at the site to this day. There are now estimated to be more than 7 million Palestinian refugees and displaced people. Nader Liftawi was born a refugee in the Sheikh Jarrah neighbourhood of East Jerusalem in 1970 and was brought to the village regularly by his father from an early age. "I have brought my children here since they were young. I come at least once every month to check the houses, clean the graves and smell the air. This is everything to us," explained Nader. Nader Liftawi, Palestinian refugee form Lifta. Lifta, West Jerusalem, Israel. March 27 2015. 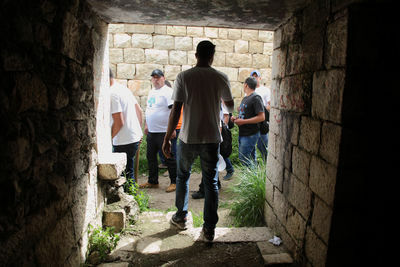 For the village's refugees who remain in East Jerusalem today, visiting the village is possible, whilst those in the West Bank or outside Palestine need to secure permits to enter Israel or cross checkpoints and other security obstacles. Such permits are rarely granted by Israel for holders of West Bank ID cards or UNRWA-registered Palestinian refugees. 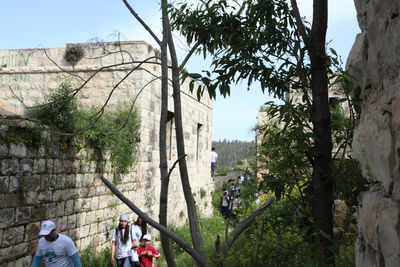 Lifta was forcibly depopulated in early 1948 by Zionist militias, well before the official establishment of the State of Israel. Some Nakba survivors say that they were told to leave temporarily and would later be allowed to return. Yakoub Odeh is one of Lifta's Nakba survivors and also the head of 'Sons of Lifta' - a community group that was established by the refugees in defense of their village and their right to return to live in the village: "We are here to remember, we are here to learn and we are here to say we will never give up (our struggle for return)." Yakoub Odeh and Palestinian refugees from Lifta. Lifta, West Jerusalem, Israel. March 27 2015. Lifta is unique amongst the Palestinian villages that were depopulated during the Nakba in that the majority of its houses remain structurally intact and are not occupied by Israelis today. After a journet of only 10 minutes the refugees arrived back in the village from which they were forcibly displaced in early 1948 by Zionist militias. Palestinian refugees from Lifta, Lifta, West Jerusalem, Israel. March 27 2015. 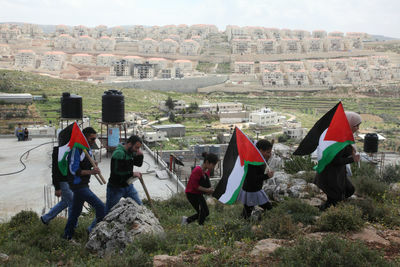 Palestinian refugees boarded buses in the East Jerusaelm neighbourhood of French Hill to make the short journey across the Green Line to their home village of Lifta to commemorate Land Day. Palestinian refugees from Lifta, March 27 2015, French Hill, East Jerusalem, Palestine. 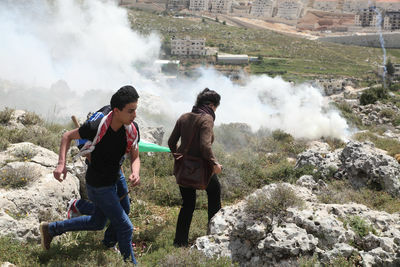 Activists flee as Israeli forces rain tear gas down on them. 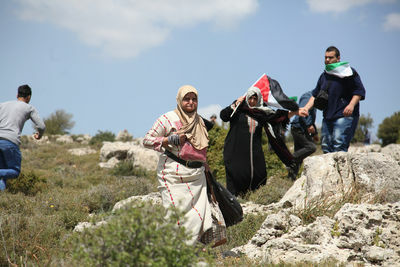 The tear gas stopped the olive tree planting event being held to commemorate Land Day in the Palestinian village of Wadi Fukin. 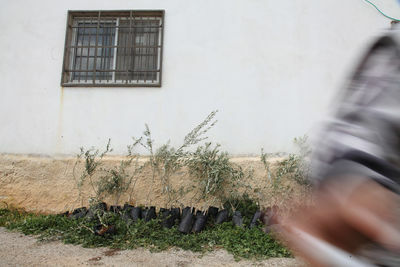 As the Land Day action is brought to an abrupt halt in Wadi Fukin, the majority of the 350 olive tree saplings remain unplanted outside a house in the village after activists were forced to escape from clouds of tear gas that was fired by Israeli soldiers. Two elderly Palestinian women attempt to make their way down the hill in Wadi Fukin to escape from the tear gas that is being fired by Israeli forces. 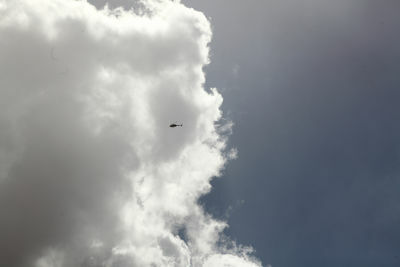 An Israeli security helicopter circles above Wadi Fukin during the olive tree planting event to commemorate Palestinian Land Day on March 30th 2015. 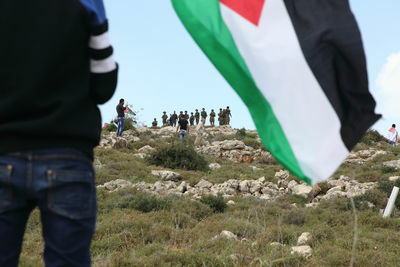 Israeli soldiers line up on a hill top in Wadi Fukin as Palestinian activists watch from a distance during an olive tree planting event to commemorate Land Day in the Palestinian village of Wadi Fukin. The refugees hung signs in various locations around Lifta reaffirming the history and Palestinian identity of the village.